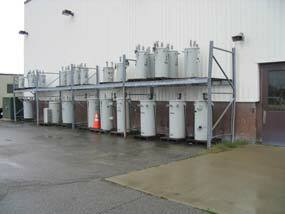 chemical storage at seventeen DTE service centers. They operate as a pull out facility for DTE line trucks. The service centers store and distribute electrical equipment and materials used by the line crews. Transformers and portable substations are staged on site and DTE utility vehicles are stored, fueled and maintained at the Service Centers. containment issues on their sites. and even the design and construction of a storm water detention pond. costs for each storage area.